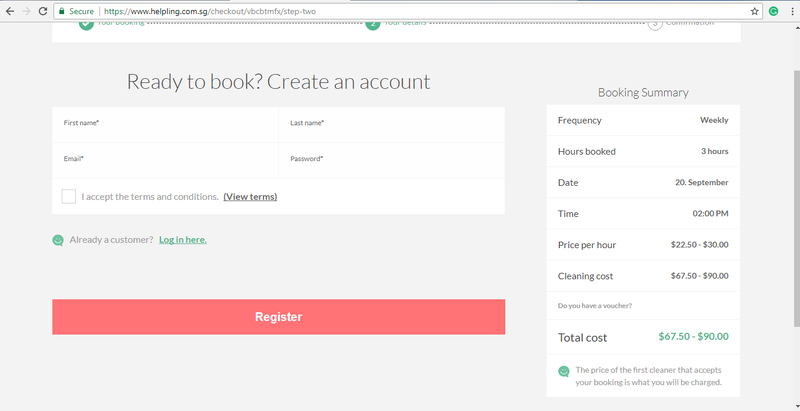 New Helpling Customers who make a "Weekly/Fortnightly" booking earn $30 Cashback! Helpling's Terms and Conditions apply. Existing Helpling Customers who make their FIRST "Weekly/Fortnightly" booking earn $30 Cashback! New Helpling Customers who make a "Just Once" booking earn $15 Cashback! Existing Helpling Customers who make a Weekly/Fortnightly, provided their last recurring booking was made at least 6 months ago, earn $15 Cashback! On Demand Cleaning Service With Helpling! Helpling is an e-commerce company for on-demand cleaning services. With its headquarters in Berlin, Germany, Helpling has operations in more than 14 countries including Ireland, Italy, France, Australia, United Kingdom, UAE, Netherlands and Singapore. In today’s busy lifestyle, sometimes it’s difficult to juggle personal and professional responsibilities simultaneously. On such occasions, Helpling can help you maintain a squeaky-clean home without any hassles. 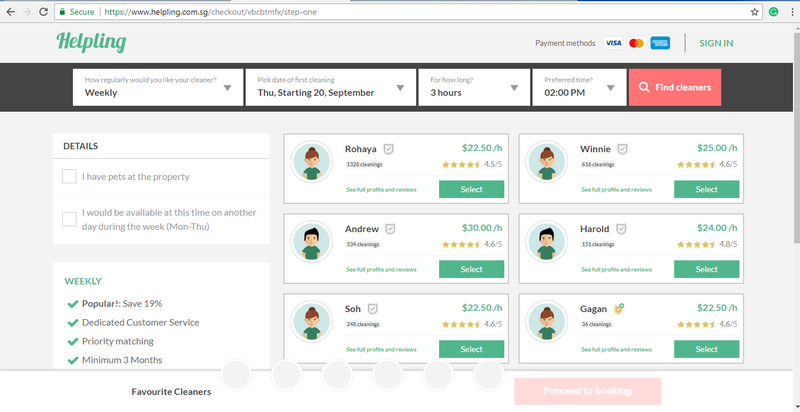 Helpling is based on the marketplace model where the online portal connects its users with freelance cleaners. Users can book cleaning services either on hourly basis or per room basis. All you need to do is to log on to the Helpling sg website or download the Helpling app to avail its remarkable services. Helpling was founded in 2014 by Benedikt Franke and Philip Huffmann. The startup company was launched in Germany and within 2 months, it expanded to France, Austria, Sweden and the Netherlands. In December 2014, Helpling raised a series A round worth US$17 million which helped further expansion of the company’s operations to Singapore and around 150 cities in Europe, UAE and Australia. In March 2015, Helpling acquired Spickify, a Singapore cleaning service which helped them to establish a stronger base in Singapore. A few weeks later, the company announced a series B funding of EUR 43 million. In the month of July, Helpling acquired another online marketplace called Hassle.com which further strengthened the company’s position in market and made it a dominant player for on-demand home services in the Europe and other countries. As of now, Helpling is the most widely-available platform for home cleaning services, with operations in more than 150 cities around the world. If you’re too busy at work and cannot find time to clean your home, worry not! Helpling Singapore is a reliable solution for your problems. It is primarily a marketplace offering home cleaning services to its customers. 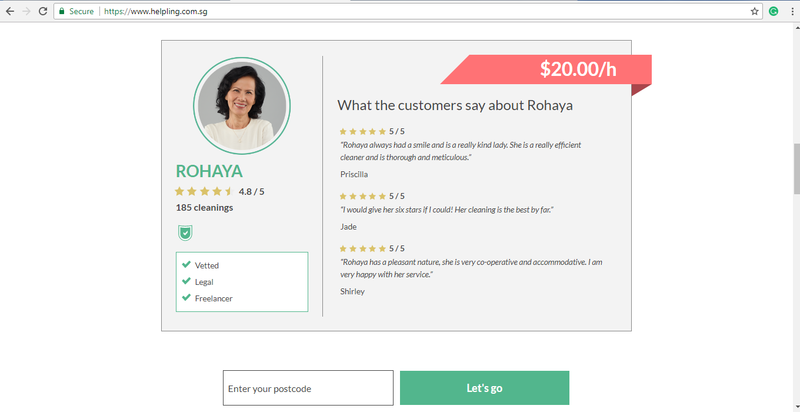 The online marketplace links local freelance cleaners with customers across Singapore. Helpling lists many registered professional cleaners after conducting proper background checks. It ensures that you, the customer, has easy access to the best cleaning service providers at highly competitive prices. So, fret not and trust Helpling cleaning services to hand you over a sparkling clean house after they’re done with their job! The Helpling sg website is a customer-centric website with a user-friendly interface for convenient booking experience. The homepage of the website features the top-rated cleaners along with their ratings and reviews from customers. This enables you to get an idea about the best freelance cleaners in the city. To book one of the listed home cleaning services, enter your postcode in the box at the homepage. Click on “Let’s Go” to proceed further. You will be directed to the booking page where you will find the list of cleaners available around your location. 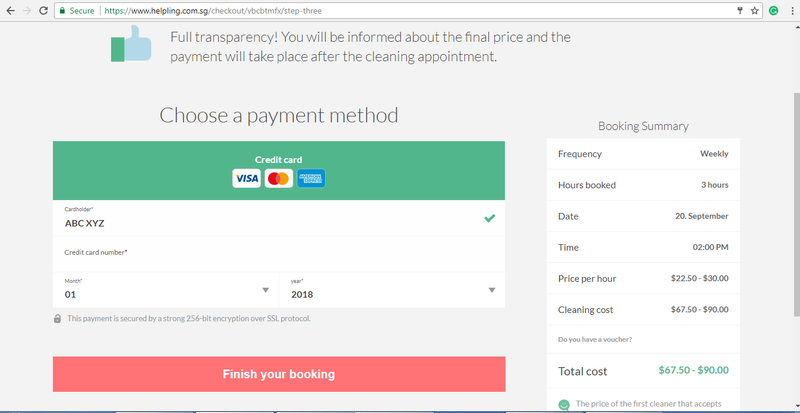 The header on the page requires you to select “How regularly would you like your cleaner?”, the starting date for cleaning service, time duration of the service and the time of appointment. You can search for the cleaners available on your preferred date by clicking on “Find Cleaners”. 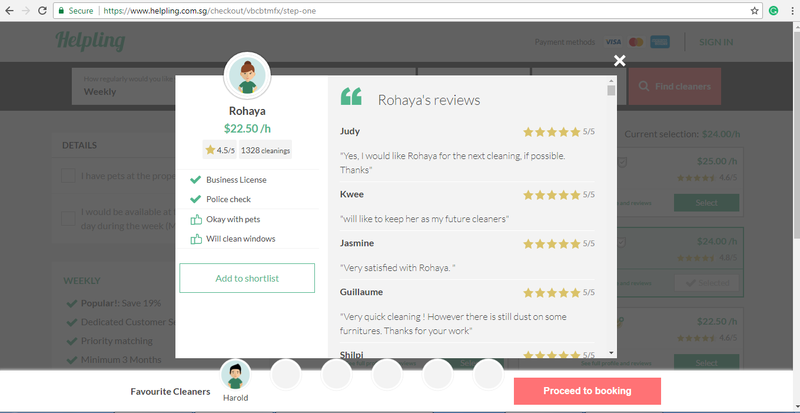 Click on the cleaner’s profile to see the details of the cleaner and the reviews posted by their past customers. Select a cleaner from the listing. Helpling suggests you select at least 6 cleaners so that there are no problems with availability on your selected date and time. After selecting, click on “Proceed to Booking”. You will be directed to the Booking Summary page. Log in to your account and proceed with the payment process. Provide your details such as name, address and contact details and proceed to pay on the next page. Your booking will be confirmed after you provide your card details. The payment will take place after the cleaning appointment. Helpling accepts payment via credit cards verified by VISA, MasterCard or American Express. This payment option is a safe and secure way to transfer money online as your information is completely protected with leading encryption standards. Helpling offers many discounts and deals to its customers from time to time. Some Helpling discounts are offered for a long time while some Helpling discount codes are available for a limited period only. Customers can save a lot of money on their bookings by applying the Helpling promo codes or Helpling voucher codes that the online platform lists under its special deal section. The online marketplace also offers many Helpling coupons and Helpling vouchers during Helpling promotions. At present, customers can earn up to $30 cashback on their bookings if they book their cleaning services with the merchant via a registered account at ShopBack. Helpling was started with the vision to provide convenient and trusted home cleaning services to the working class. The services are even more convenient and pocket-friendly when they are availed with discounts, offered by Helpling. Step 1: Enter your postcode in the box on the homepage and click on ‘Let’s Go’. Step 2: Select and enter all the details for making an appointment. Choose the cleaner you wish to hire and click on “Proceed to Booking”. Step 3: You will be taken to the Booking Summary page. Enter your Helpling promo code or any other applicable Helpling coupon code in the box below your booking summary and click on ‘Apply’. Your Helpling promo will be applied on your booking cost. Step 4: Provide the details of your credit card details and complete the booking process. Step 1: Visit the ShopBack website and select Helpling from the list of merchants and brands on the homepage. You can also use the search box to find the link to Helpling store. Step 4: If you are willing to find more attractive deals and coupons, check out the ‘Helpling Discount Code & Promotion' section. Step 5: You will be directed to the Helpling website to browse and select the cleaner you intend to hire. Step 6: You will be eligible to earn cashback from ShopBack on confirming your booking. The cashback rates might differ based on your history with ShopBack, i.e. whether you are a new or an existing customer. The cashback offer is not applicable on bookings made on Helpling app. Customers are not permitted to engage any Cleaning Service Provider on the Helpling database other than through the website. The failure to comply may result in indefinite suspension of the user’s profile/account. Any false, speculative or fraudulent booking request is prohibited. Any illegitimate booking request may result in denial of access to the website. Customers are prohibited from advertising on the website. Upon successful completion of the booked services, an invoice will be issued to the customer. The customer agrees to the automatic processing of payment of the booked services fee by the payment agent once the invoice has been issued. Customers can amend or cancel a single event on the website, free of charge for up to 48 hours before the scheduled booking time. If a customer amends or cancels an event within 48 hours to 24 hours before the scheduled booking time, he/she will be liable to pay a cancellation penalty equivalent to one hour’s worth of booked service fee. If a customer amends or cancels an event within 24 hours before the scheduled booking time to any time thereafter, the person will be liable to pay the full amount of booking service fee as cancellation penalty. There are many more terms and conditions that you can read here. For any query or assistance, customers can contact Helpling through one of their contact forms, available on the website. You can also send an email to the customer service at [email protected].